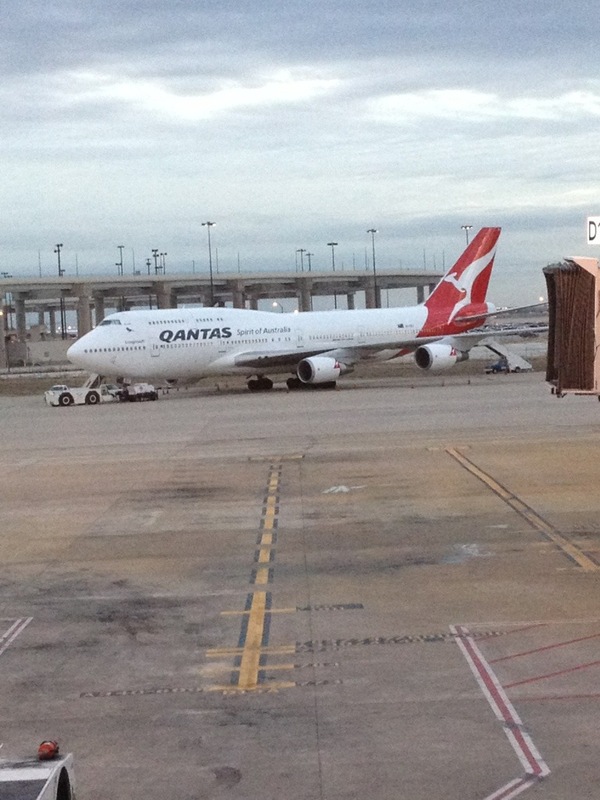 Highlights: Great nights sleep, seeing Qantas Plane! A great nights sleep in a very comfortable bed. The included cooked to order breakfast was very nice – Embassy Suites are a very good hotel option. Checkout was supposed to be noon but reception let me push this back to 2 pm which was nice. As I could not check into my flight until 6 pm I wanted to delay arriving at the airport as long as possible. There was a burger place near the hotel so after storing my bag I spend an hour there enjoying a WhataBurger. the rest of the time i used the free wifi at the hotel to catch up with my various fellow travellers. Eventually it was time to leave a I caught the courtesy shuttle to DFW. Checkin was 4 hours before the flight normally it is 3 hours and I’m guessing most people didn’t know the earlier time as there were only 5 people waiting. I chatted to one charming American couple who where looking forward to there trip to Australia and had lots of questions. Security / Border Control staff in Dallas are very courteous. I think I’d like to enter and leave the USA very this airport if possible. Once airside I got to see the QANTAS plane and I started to feel like I was already home 🙂 I had lounge access meaning I got to watch planes leaving in luxury with free drinks and finger food before boarding commence at 9.15 pm. I had allocated myself an Exit Row seat in business. My seat had no one next to me and with heaps of room it looked like the worlds longest flight might be fine. This entry was posted in World Trip 2012 and tagged Dallas, USA. Bookmark the permalink.